A rear den floor plan offers a more intimate living space as it separates the den from the other rooms. This is an ideal floor plan for families with children or couples who regularly entertain guests. The rear den floor plan separates the den area from the other rooms in your RV. This creates a cozy space to relax in a recliner, watch TV, or enjoy the view from the back windows. Having a separate room for a den offers several advantages, such as additional pass through storage, lots of seating, large TVs, and more. The rear den creates a separate living space that can be utilized by families with children or RVers who welcome guests frequently. This floorplan is usually found in travel trailers & fifth wheels. 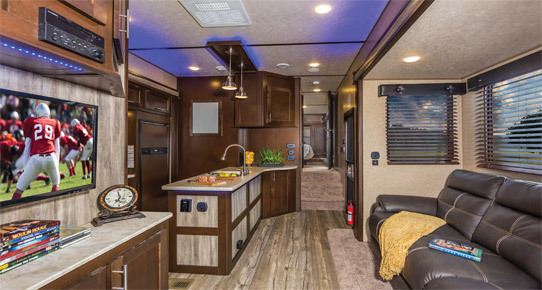 Many modern RVs offer rear den floor plans. 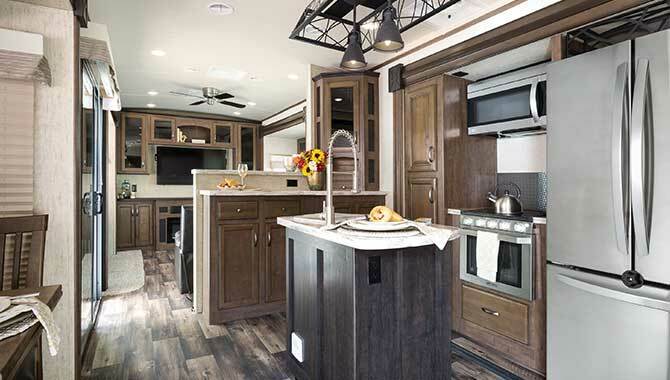 Shop our online selection of RVs with rear den floor plans at your convenience or visit our dealership to see your favorite models in person.